Gifts of Fostering - People Places, Inc. In the midst of this holiday season, have you ever stopped to think about the gifts you RECEIVE as a foster parent? It’s easy to recognize the many gifts foster parents give to children placed in their homes, but what about the gifts the experience brings foster parents? The greatest gift is the opportunity to be a mom or a dad for as long as the child is placed with you. A child who likely both craves and may even fear a relationship with a parental figure. 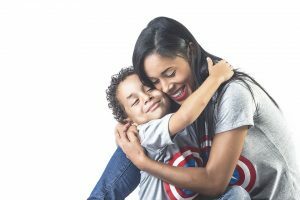 Parenting is beautiful and messy – sticky kisses, scraped knees, curfews, “I love yous,” and the little moments of trust that can start to form in a child who has experienced abuse or neglect. Foster parents also get the gift of staying young. Children keep you young by their very nature. They are active, busy beings who require constant attention. Children of any age add a dimension to your life that keeps you vibrant and lively. They sweep you up in their enthusiasm as they show what they’ve learned about themselves, their world, and what it means to be in a family. Foster parents get the gift of always learning. And not just about trauma, attachment, or mental health issues. Every foster child who comes into your home will have their own unique interests, hobbies, and heroes. One day, you may be learning about dinosaurs, the next about about state capitals, Pokemon, Star Wars, Harry, Ron, and Hermione, or a not-so-famous hockey player. Each child in your home is like a new, little professor with a whole curriculum of their very own. The flip side of learning is the gift of being a teacher. Most kids who come into foster care have experienced adversity. Often, they have not had opportunities many of us take for granted. They may have never had a birthday party, gone fishing, been to a movie theater, or taken a hike. You can teach them a new card game or take them to a restaurant that serves cuisine they have never tasted before. Watching children experience new things is such a gift because- if not for you, it might not ever have happened. Foster parents get the gift of changing lives. To be a part of forming young minds is a wonderful thing. Just by being yourself, by setting an example, you can teach a child a value, ethics, or morals, which can last them a lifetime. Sharing your beliefs and faith, your hopes and dreams is a gift. Some foster children will become members of your immediate family and that is a gift. Others become friends or extended family, another gift. And, if we’re being honest, when that one foster child who has driven you crazy, pushed all your buttons, and tried your patience finally goes home, well, that can be gift, too. The gifts you receive as a foster parent are too many to list. There are those candid moments when you get to look into another human being’s soul. There are flashes of brilliance when a child solves a problem after numerous failures, and silly moments of uncontrollable laughter. There can also be solemn moments of peace when a child truly feels safe in your presence. These are all gifts and are only fully appreciated by those who give their hearts and homes to children (YOU) and those closest to you, including your People Places team and support staff. To all foster parents: give yourself time to receive and appreciate all the gifts that fostering can bring into your life, and thank you for all the gifts you give the children in your care.